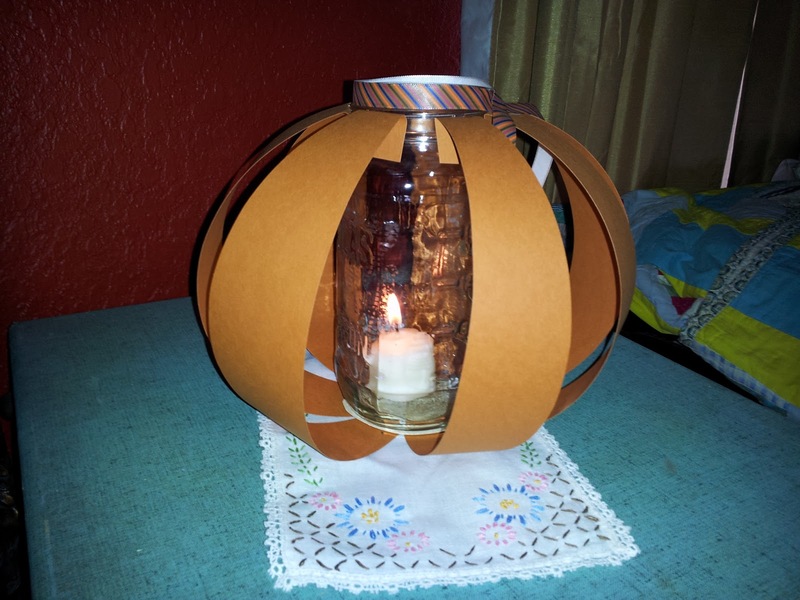 I've had this idea for a Mason Jar Pumpkin Lantern for a while. There are so many cute ideas for mason jar crafts out there. 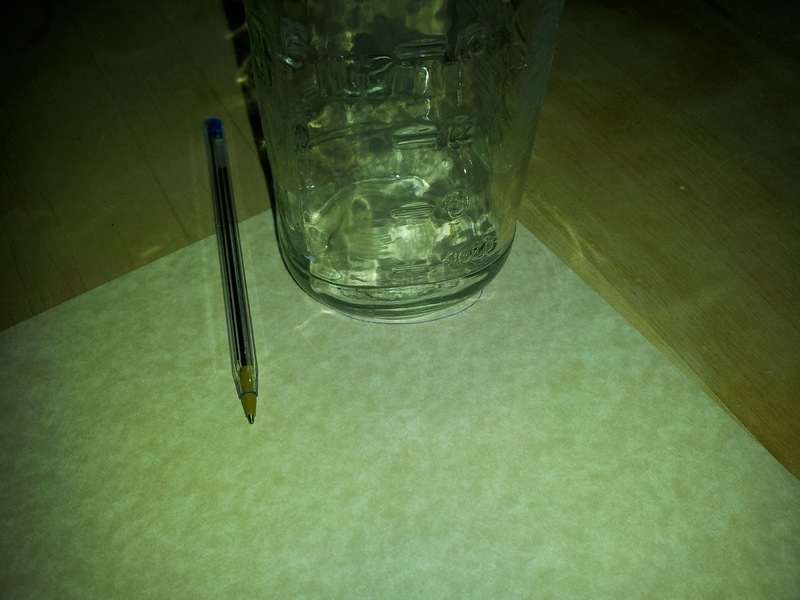 Google it or simply plug in "mason jar" into Etsy or Pinterest and you'll have craft ideas for years! Since I've been in the mood to get crafty over the last week or so, I finally sat down to try and realize this vision in my head. 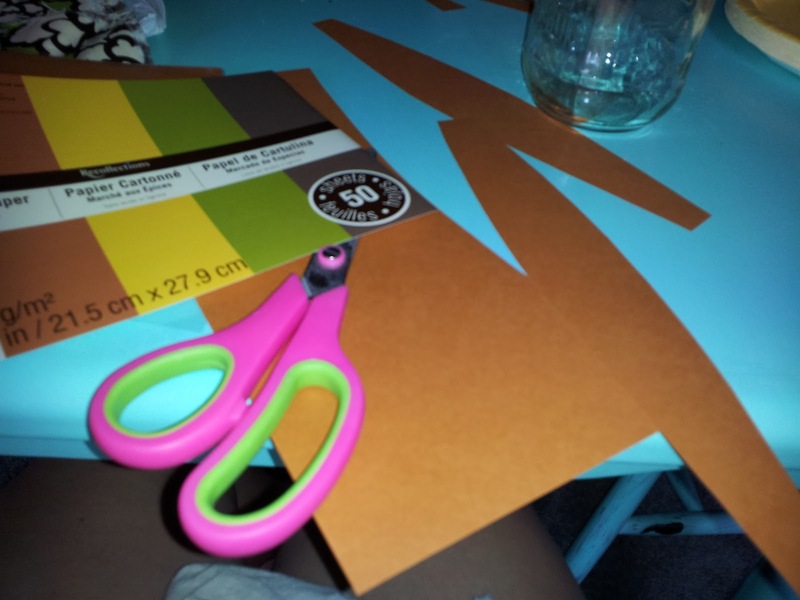 I started with some cardstock in Fall colors. (I found these three packs for $10 at Michael's in all different shades just the other day) I cut strips the length of the paper, slightly fatter in the middle and thinner at the ends. I don't have a template here; I just eyeballed. Plus I like the idea of non-uniformity in crafts. As I've said before, most (all) of my sewing and crafts (and cooking) are really an art in estimation! Then I set the ends under the mason jar to see how many I'd need. You could overlap them if you want more coverage, or space them out more. You could also do alternating colors or something other than orange, since pumpkins and gourds come in all different shapes, colors and sizes! 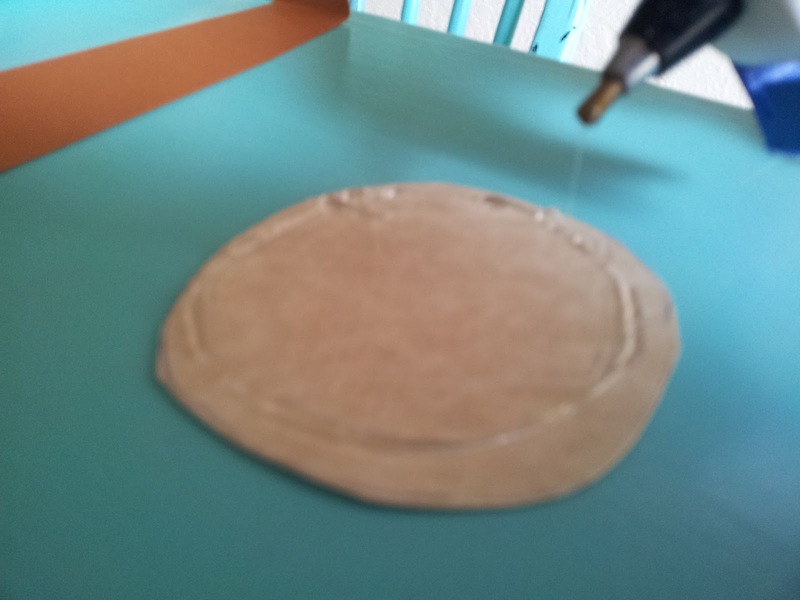 Then, I traced the bottom of the jar onto another piece of cardstock and cut out the circle. and flipped it over onto my little circle of pumpkin strips and lightly pressed down until it was stuck. 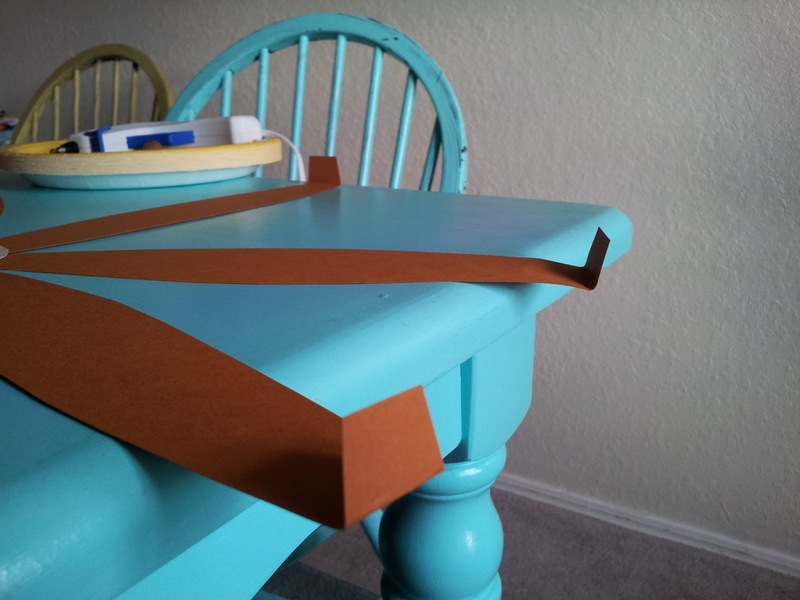 Fold up the edges of the strips about an inch. Here's where I wasn't quite sure what to do yet. 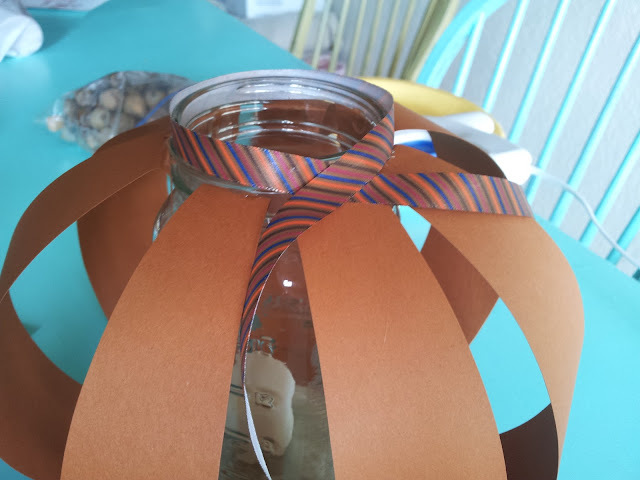 At first, I'd envisioned using raffia to tie the underside of the folded strips onto the rim of the jar, but I was having a hard time holding onto them and getting them to stay put. 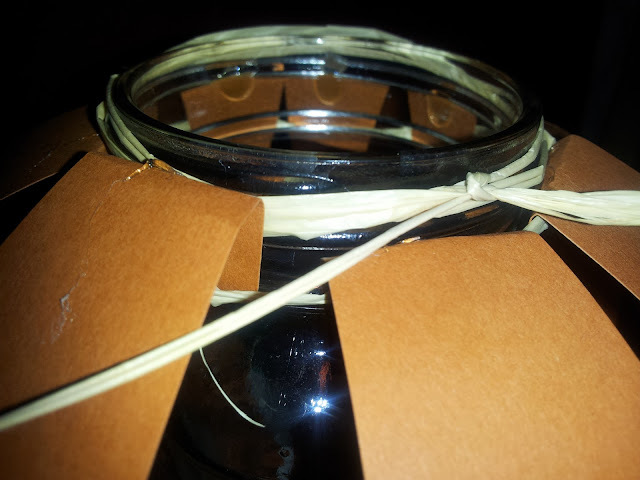 So, since I was impatient, I just hot-glued them onto the jar, which seemed to work fabulously! 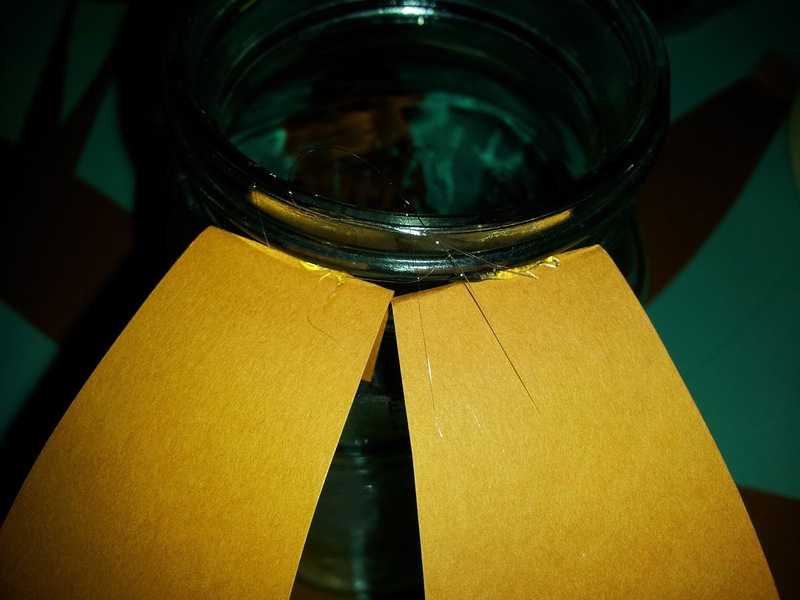 So, I hot-glued little dots on each folded strip and stuck it to the jar. 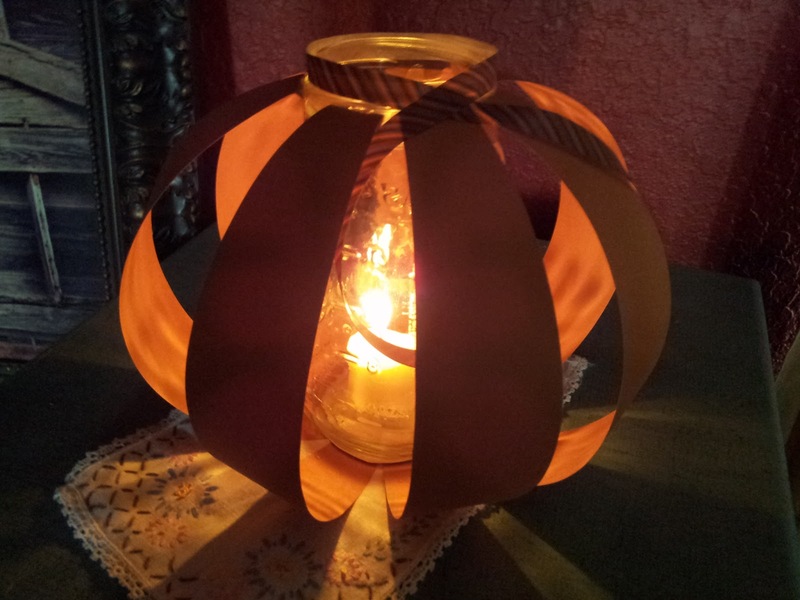 Then I wrapped a little piece of ribbon (found at Target in the dollar bin) around the top, which reminded me of a cute little scarf or necktie for my pumpkin lantern! I hot-glued him on there too! Lovely! This is JUST as I'd envisioned in my head, and I was ever so pleased with myself. 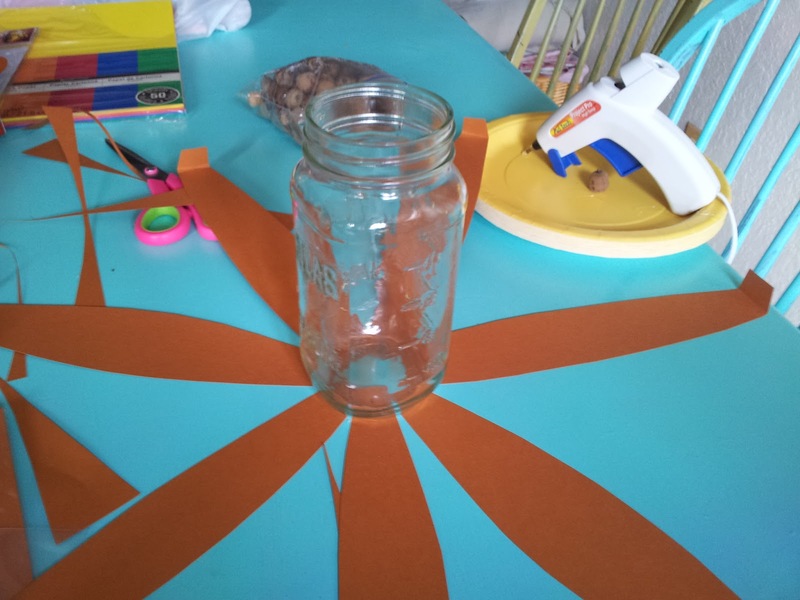 Until the jar got hot from the candle and started re-melting the hot glue and the strips of paper started popping off! So, I had to remove that cute little neck-tie and go back to my original idea of raffia. Sorry, I didn't get a shot of me doing it because I needed both hands, but I did get a close up shot of the end result. 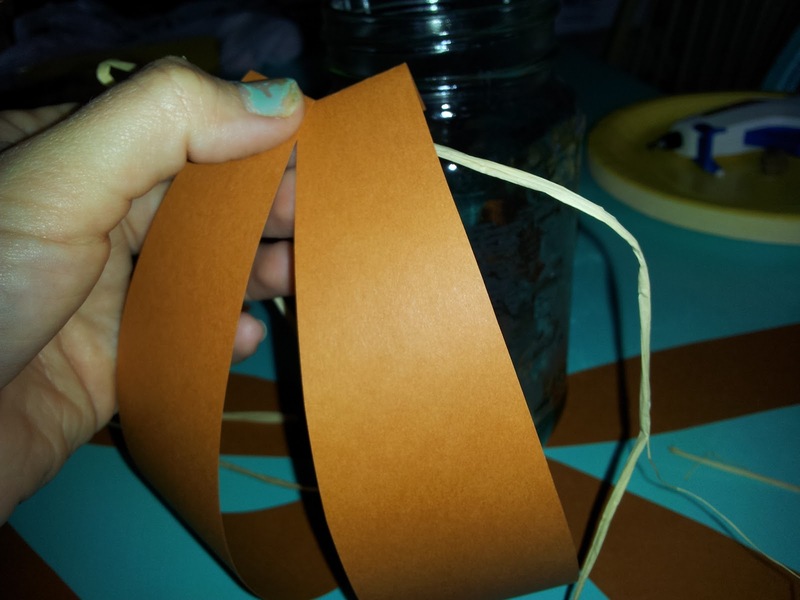 I did use the raffia on the underside of the paper strips, under the fold, to tie them onto the jar. 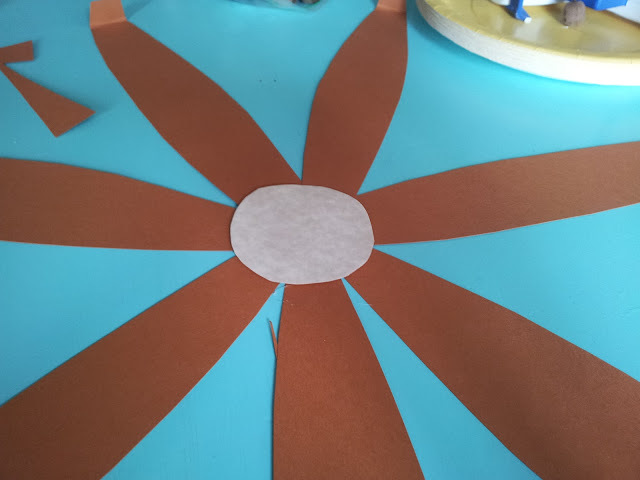 Once the raffia wrapped around once, I over lapped the pieces, brought them to the top side of the paper strips and wrapped the raffia around the upper rims of the jar again before tying it. I hope that makes sense! Maybe you'll come up with a better method, and I hope you'll share it with me! 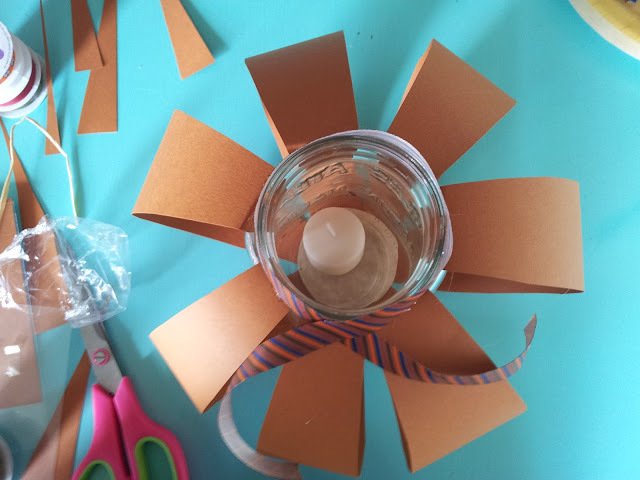 In reality, you won't really need to glue anything to the jar itself, so that when Fall is over, you can take the pumpkin lantern off of it and use it to make something for the next holiday!